The Ricketts description set me off looking for information about Membranipora membranacea. It is a fascinating little colonial animal. Here are some notes and a sketch. From Intertidal invertebrates of California. "The bryozoa, or Ectopracta are virtually all colonial forms, with each colony (zoarium) composed of many small attached individuals (zooids). A colony originates from a single, sexually produced individual (the ancestrula) and increases by asexual budding of new individuals. Bryozoans are widely distributed in the sea and many are found on rocky shores that are exposed at only the lowest tides, or on harbor pilings or ships hulls. At first glance some colonies may be mistaken for bushy types of hydroids brancing corals or marine algae. The individual zooids in a bryozoan colony are usually less than 1mm long and each is encased in a secrteted outer cuticle or exo-skeleton, which stiffens the colony and provides support and protection for the enclosed soft parts. " 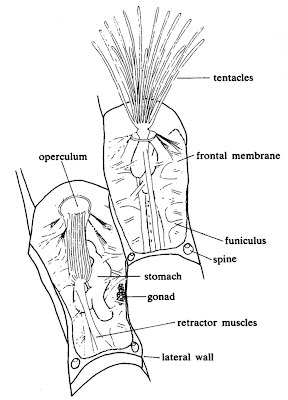 Here is a drawing of a couple of zooids - one with tentacles retracted and the other in full action (taken from Bock, P.E., 1982. Bryozoans (Phylum Bryozoa). In: Shepherd, S.A. & Thomas, I.M. (editors), Marine Invertebrates of Southern Australia Part 1: 319-394. South Australian Government, Adelaide). 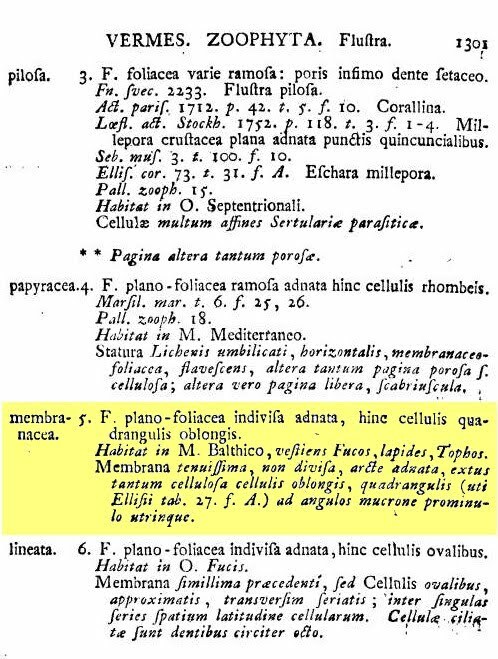 Membranipora was first described by Linnaeus in 1767 (Linnaeus, C. 1767. Systema naturae, Tom. I. Pars II. Editio duodecima, reformata. Holmiae. 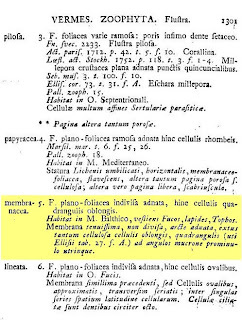 (Laurentii Salvii). : 533-1327.). 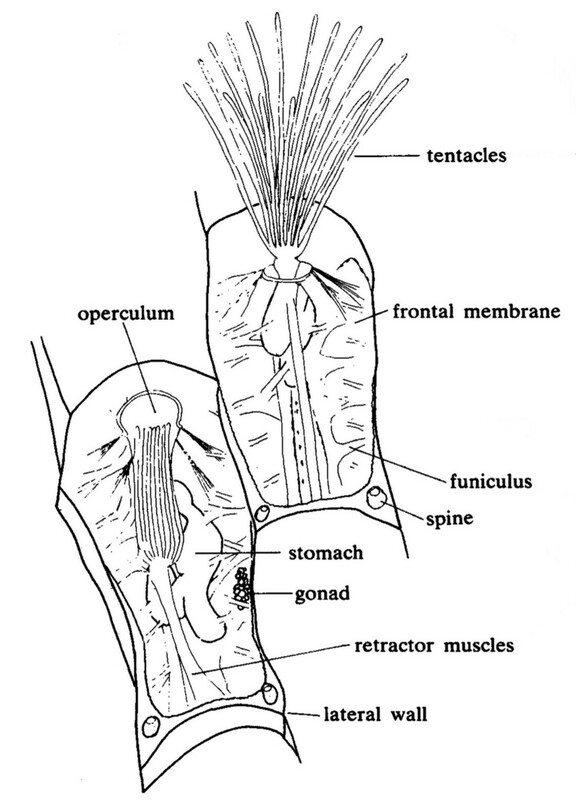 In his system it was originally Flustra membranacea. The page describing the creature is shown.